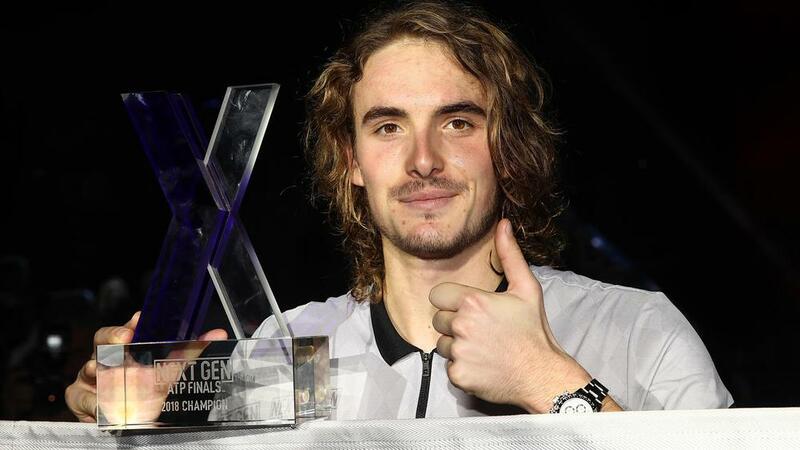 Stefanos Tsitsipas overcame Alex de Minaur to win the Next Gen ATP Finals title. Stefanos Tsitsipas capped a breakthrough season by winning the Next Gen ATP Finals decider against Alex de Minaur on Saturday. The Greek, 20, rallied for a 2-4 4-1 4-3 (7-3) 4-3 (7-3) win over Australian De Minaur in the final in Milan. Tsitsipas, who started the year ranked in the 90s, has risen into the world's top 15 on the back of an impressive 2018. He claimed his maiden ATP World Tour title in October and his year has included wins over the likes of Novak Djokovic and Alexander Zverev. Tsitsipas served 10 aces against De Minaur but was only able to convert one of his eight break points. But he did enough to make it two wins in as many meetings with the 19-year-old Australian, who has also enjoyed a good year, in 2018. "It feels great. I've been playing some great tennis this week here in Milan," Tsitsipas said, via ATP World Tour. "It was a fantastic match. I stayed calm although I had a chance twice to win the match, but remained calm. I was aiming to win that match. I was mentally very strong and that was proven in the tie-break in the last set."